More than 70 finance companies are now included with a technology startup that’s aiming to provide consumers with an online auto financing search and booking process similar to what they already can use to secure flights or hotel rooms. SuperMoney, which rolled out a similar personal loans platform back in April, this week officially launched its auto finance tool, according to a blog post on its website. 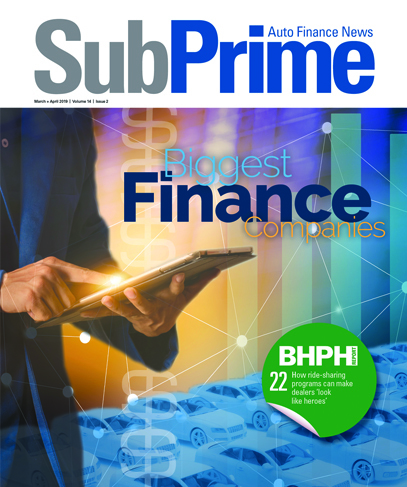 A further search of SuperMoney’s website showed the variety of auto finance providers that are listed with this technology company, including subprime specialists such as Credit Acceptance, Exeter Finance, First Investors Financial Services, Santander Consumer USA and Westlake Financial Services. A wide array of captives are listed, including GM Financial, Ford Motor Credit, Hyundai Motor Finance, Nissan Motor Acceptance Corp. and Toyota Financial Services. The commercial bank involvement is extensive, too, as the list features Bank of America, SunTrust, Wells Fargo, Fifth Third Bank, Regions Bank and PNC Bank. Several other market leaders have a connection with SuperMoney’s platform, as well, such as Ally Financial, Chase Auto Finance, Capital One Auto Finance and USAA. SuperMoney explained in the blog post that its auto finance offer engine can allow consumers to submit a single, online application and receive multiple offers in return. The site indicated the tool can make “apples to apples” comparisons when consumers are shopping for the best auto financing rates, fees and terms. The platform can help consumers if they’re looking to make a vehicle purchase at a dealership or through a private-party transaction, as well as if they’re looking to refinance their current installment contract. The blog post also noted that participating finance companies only conduct a soft pull of consumer credit files during the initial process. Lulic replied to a message sent by SubPrime Auto Finance News asking for more details about how SuperMoney got involved in the auto finance space. Lulic described how SuperMoney was able to land arrangements with such an array of auto finance providers. “SuperMoney has been around for several years. We’ve built relationships over time and continue to do so. Our site traffic started to grow exponentially in the last year which has made the conversations quite a bit easier,” he said. Lulic then pointed out how ow SuperMoney can cater to consumers throughout the credit spectrum. “SuperMoney stores detailed data on every financial service listed on the site,” he said. “For example, target FICO ranges, product attributes such as loan amounts, supported states and basic underwriting guidelines. “This allows us to narrowly segment every users who lands on our website to help them discover their best options. Our goal is to help every user find their best option,” Lulic continued. Finally, Lulic also addressed how SuperMoney generate revenue through auto financing. “SuperMoney is an advertising platform, and we are compensated for the referrals we make to our partners on everything from a CPC (cost per click) to a CPA (cost per acquisition) basis,” Lulic said. “Unlike dealers, this is not structured as a dealer reserve markup. The offers shown in our loan offer engine are the offers returned by our partners and we don’t adjust them to account for our own fees,” he went on to say.